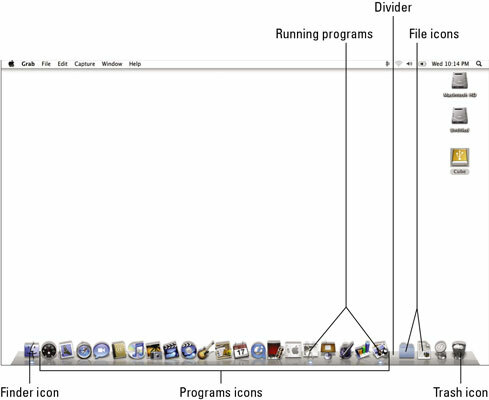 The Mac Dock is a rectangular strip that contains both program icons and file icons. To help keep your icons organized, the Dock places Program icons on the left side of a divider and File icons on the right side. You can also move, resize, magnify, or hide the dock. Besides acting as a convenient place to store and find frequently used programs and files, the Dock can also tell you which programs are currently running by displaying a glowing dot under the icon of each running program. Choose the Apple key→Dock→Dock Preferences. A submenu appears which lets you change the position of the Dock. Click a new position — Left, Bottom, or Right. A check mark appears next to your selection, and the Dock makes its move. The Dock can grow each time you add more Program or File icons to it. However, you may want to modify the size of icons on the Dock so that the Dock as a whole doesn’t appear too small or too large. The Dock Preferences dialog box appears. Drag the Size slider to adjust the size of all icons on the Dock. Click the Close button of the Dock Preferences window. The individual icons on the Dock are resized according to your wishes. Another way to resize the Dock is to move the pointer over the Dock divider, hold down the left mouse button, and drag the mouse left or right. The more icons you store on the Dock, the smaller all icons appear as the Dock shrinks to squeeze all icons on the Dock. When icons appear too small, it can be hard to see which icon the mouse is pointing at. To help identify the icon that the pointer is over, you can turn on magnification, which basically pumps up any icon beneath the pointer. Select (or clear) the Magnification check box. 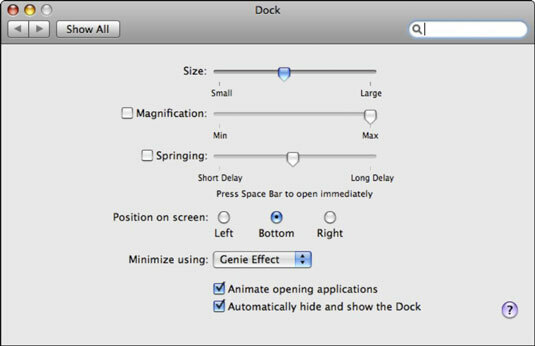 Drag the Magnification slider to adjust the magnification of the Dock. Click the Close button of the Dock Preferences dialog. 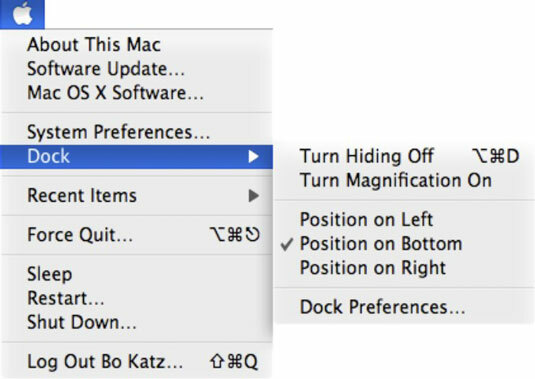 For a fast way to turn magnification on or off, choose the Apple key→Dock→Turn Magnification On (Off). The Dock may be convenient, but it can clutter up the screen. To get all the advantages of the Dock without seeing it all the time, you can hide the Dock. Hiding the Dock means that the Dock tucks itself out of sight, but as soon as you move the mouse near the edge of the screen where the Dock is located (bottom, left, or right), the Dock pops into view. To hide (or show) the Dock, click the Apple menu and choose the Apple key→Dock→Turn Hiding On (Off).